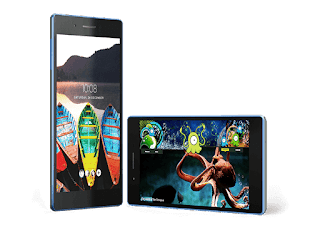 Lenovo has launched a new Tablet Device called Tab 7, The new tablet 7 comes with a front-facing speaker and its feature 6.98-inch display with a Screen Resolution of 1280x720pixels. The tablet 7 with 4G VoLTE is now available in 👉Flipkart stores. The Lenovo Tablet 7 is a Dual Sim (Nano) and its run on Android 7.0 Nougat. The Tablet phone is powered by a 1.3Ghz Quad-Core Mediatek processor with 2GB RAM and 16GB of Inbuilt Storage which can be expanded up to 128GB of SD Card if you want more space. The Lenovo 7 Tablet Sports Sports 5-Megapixels at the rear camera, and there's also a 2 Megapixels at the front for a selfie. The Lenovo tablet 7 is packed with 3500mah which can last up to 10hrs. Lenovo tab 7 Connectivity includes Wi-Fi, GPS, Bluetooth, 4GVolte, Micro USB with OTG.